Any birth predictions?! Win a prize! Well, I’m now 38 weeks pregnant, and have been having tightenings for about a week. These have bee getting increasingly regular & lasting for longer periods of time, as well as feeling stronger. My colostrum has come in and I’ve gone up a cup size or two over the last few weeks. Squidge has been head down for a couple of months now, and was head butting the cervix at my 36 week scan. I’m pretty sure he/she is pretty much engaged now, as my bump has noticeably dropped and I need to pee ALL THE TIME. With all that in mind, I invite you to guess Squidge’s birth details & be in with the chance of winning a prize! I will give a prize to whoever guesses the birth date correctly, the same with the weight, and again with the gender. There will be one prize for each ‘category’ and I will use a random number generator to pick a winner from the correct guesses for each (or the closest few if they’re equally close!). I know, you want to know what the mystery prize is, right?! Well, like all the best prizes, this one is edible. Even better, it’s chocolate! That’s all I’m saying for now, so if you win you’ll just have to wait and see what arrives! I am due on 25th Feb. 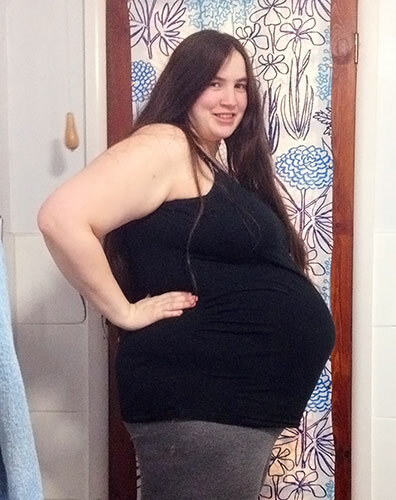 Estimated weight at the 36 week scan was 3223g ( 7 pounds 1.7 ounces). and weighed in at 3470g, or 7 pounds 10.4 ounces in ‘old money’! What day will I give birth? How much will Squidge weigh? This “giveaway” closes whenever I give birth – I will close comments asap afterwards, and discount any that are after the birth! 26th feb 7lb 11oz girl !